If you think that meal prepping has to be an all-day affair of cooking, containering, and cleaning, you couldn’t be more wrong. 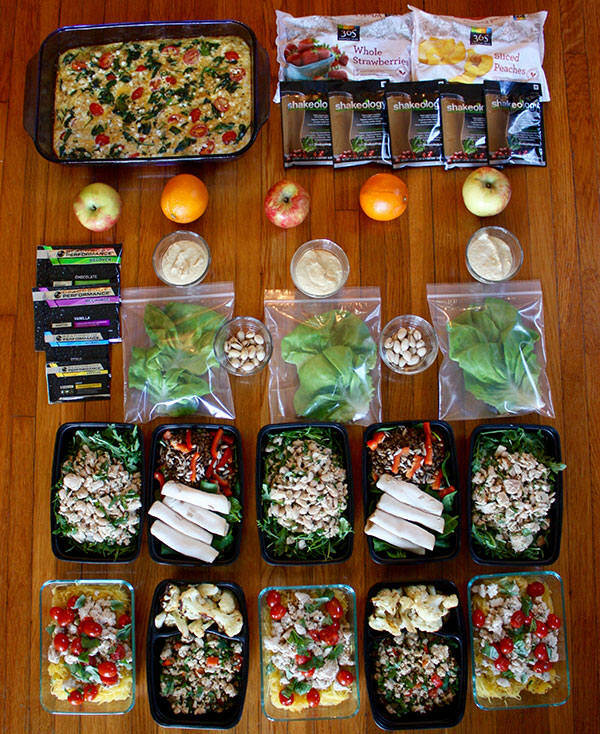 What if we told you that you can meal prep for five days in 90 minute or less? It’s true — the key is prep for your meal prep. So, wash any dishes that are sitting in your sink (it’s easier to cook quickly in a clean kitchen), purchase all of the ingredients in the grocery list that follows, and set out everything non-perishable on the table or counter. If you stay focused and move quickly from task to task, you may be able to complete this meal prep in less than 90 minutes. The guide and grocery list below will help. The menu is geared towards those at the 1,200-1,500 calorie level, but can be adjusted if you’re eating at a higher level. Just make sure to increase the amount of certain ingredients (containers) so that they match the specific plan you’re following. 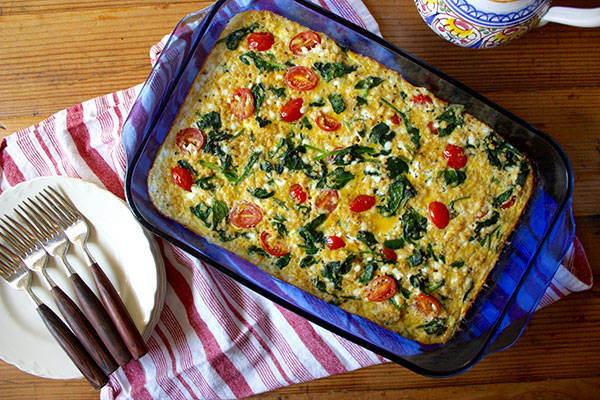 Spinach, Tomato, and Quinoa Breakfast Casserole and an apple or orange. 3 (5 oz.) cans tuna packed in water, 1½ cups white beans, 3 cups arugula, 6 Tbsp. vinaigrette dressing divided into 3 servings. Each serving = 1 Green, 1 Red, 1 Yellow, 1 Orange. 2 cups spinach, 8 oz. sliced turkey breast, 1 cup lentils, ½ red bell pepper, and 4 Tbsp. sunflower seeds with balsamic vinegar divided into 2 servings. Each serving = 1 Green, 1 Red, 1 Yellow, 1 Orange. 2¼ cup roasted spaghetti squash with 3 tsp. olive oil with 12 oz. turkey, garlic, oregano, ¾ cup roasted tomatoes, and basil divided into 3 servings. Each serving = 1 Green 1 Red, 1 tsp. 8 oz. 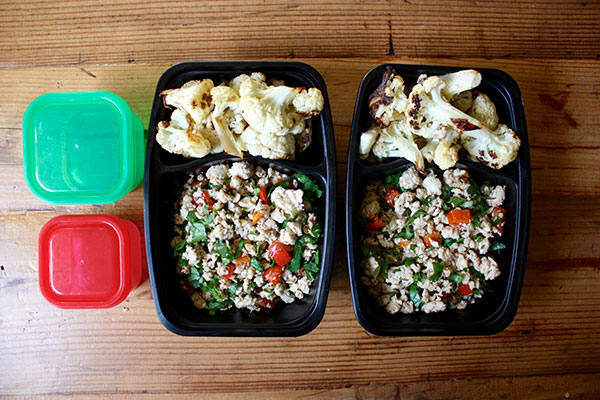 spiced ground turkey with garlic, oregano, cumin, chili powder, cilantro, ½ red bell pepper, 2 cups roasted cauliflower, divided into 2 servings. Each serving = 1 Green, 1 Red, 1 tsp. 2. Cut 1 head of cauliflower into florets (about 3 cups). Toss in a bowl with 2 tsp. olive oil to coat. Cut the spaghetti squash in half, rub the flesh of each half with 1½ tsp. olive oil. Cut 1 red pepper in half and remove the seeds; set the other half aside. 3. Place cauliflower florets and 1 red pepper half on a baking sheet. 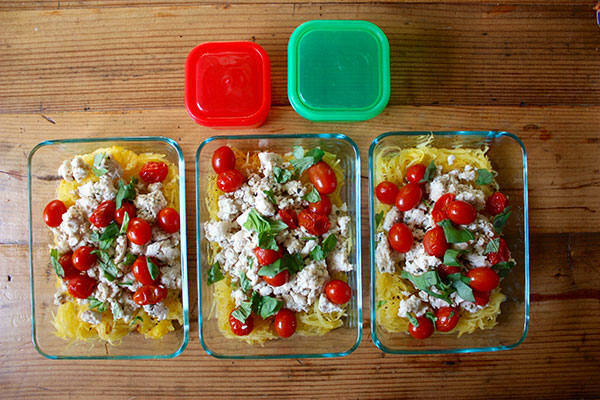 Place the spaghetti squash (cut-side up) and ¾ cup cherry tomatoes on another baking sheet. Spray red pepper and tomatoes lightly with nonstick cooking spray. Season vegetables on both baking sheets with salt and pepper. Place both sheets in the oven and let them roast. 6. Finely chop 3 garlic cloves. Heat a nonstick pan over medium heat. Add the chopped garlic; cook, stirring constantly for one minute. Add 20 oz. ground turkey, using a wooden spoon or spatula to break into smaller pieces. Cook the turkey until it is no longer pink, approximately 6 minutes. Season with 2 tsp. oregano, and add salt and pepper to taste. Set aside. 7. Drain the three cans of tuna and place the tuna into a medium bowl. Drain and rinse the white beans. Add the beans and 6 Tbsp. vinaigrette dressing to the medium bowl. 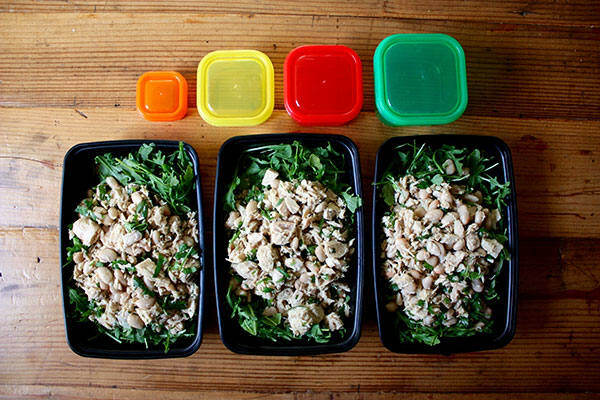 Fill three food containers with 1 cup arugula. Top arugula with tuna mixture, dividing evenly between the containers. Seal containers and place in refrigerator. 8. 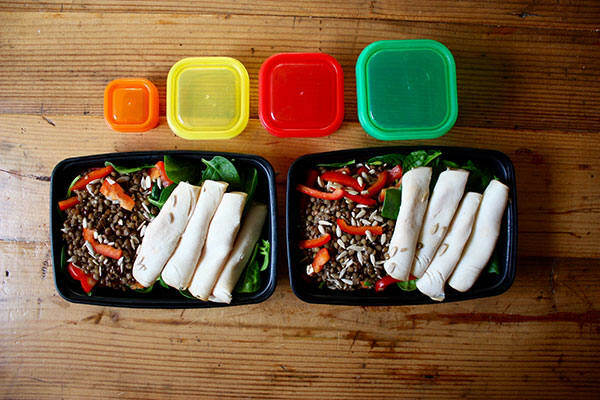 Fill two food containers with 1 cup spinach. Top each portion of spinach with 4 oz. sliced turkey breast, ½ cup lentils, ¼ chopped raw bell pepper, and 2 Tbsp. sunflower seeds. (Drizzle with good balsamic vinegar just before serving.) Seal containers and place in fridge. 9. Spray a 13 x 9 inch baking dish with nonstick spray; set aside. Heat a large pan over medium-high heat. Add 4 cups spinach and cook until just wilted, stirring frequently, about 3 minutes. In a large bowl, combine spinach, 1 cup halved cherry tomatoes, 2½ cups cooked quinoa, 8 eggs, ¾ cup cottage cheese, and salt and pepper to taste. Pour quinoa mixture into baking dish, bake for 20-25 minutes or until a toothpick inserted into the center comes out clean. Allow to cool, then cover with foil and place in fridge. Read the full recipe for this dish here. 10. Using a spoon, scrape out the flesh of the spaghetti squash. 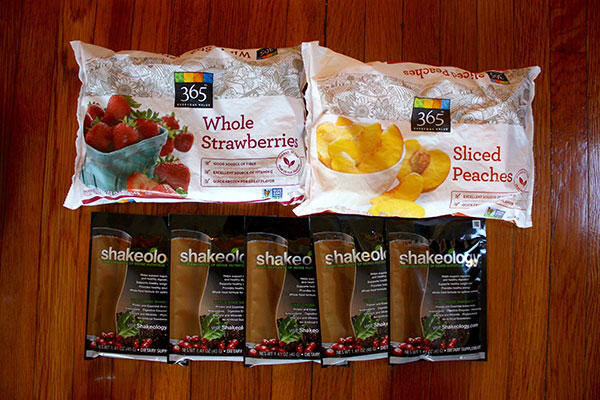 Divide squash between three food containers, adding about ¾ cup to each. Top each portion of squash with ¾ cup cooked ground turkey mixture, basil, and ⅓ of the roasted tomatoes. Seal containers and place in fridge. 11. Chop the roasted bell pepper. Season remaining cooked ground turkey mixture with 1 tsp. cumin and 1 tsp. chili powder. Add the bell pepper and as much cilantro as you want. Divide mixture evenly between two food containers. Add 1½ cups roasted cauliflower to each container. Seal containers and place in fridge. 12. Prepare three small containers with ¼ cup hummus and 3 large Bibb lettuce leaves. Count out 2 servings each of 20 pistachios.